This world economic forum on Africa represents an opportunity for Rwandan, Congolese DRC and Burundian Refugee communities living in South Africa to express their concerns over the inappropriate presence of Rwandan president Paul Kagame in the conference. His repressive policies inside Rwanda, which has produced the biggest number of refugees in the country’s history, and the destabilisation of the region, constitute the biggest obstacles to durable peace and sustainable economic development. Therefore, President Paul Kagame has no moral position to be part of this important conference on African sustainable economic development. The importance of the Great Lakes Region for the economic development of Africa cannot be overstated. It was very well stated by former US Secretary of State Madeleine Albright Addressing when addressing the Organisation of Africa Unity (OAU) on December 9, 1997. She said: «Africa matters, right now, no place matters more in Africa than the Great Lakes». She explained that: «The region’s natural and human resources as well as its strategic location make it either a catalyst or a stumbling block to African unity”. 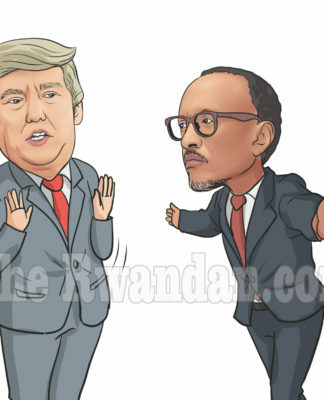 Sadly, the destabilising policy of President Paul Kagame has triggered a war that historians have called the first African World war that has led to the loss of more than 6 million people , caused permanent instability for the last 23 years and hence kept the region economically backward. As a matter of fact, President Kagame deserves an indictment for economic crimes and crime against peace in the DRC and Burundi as well as war crimes and crimes against humanity committed in Rwanda and the DRC. Freedom House report 2015 considered Rwanda as “no free county”. Reporters without Borders’ report 2015, indicates that Rwanda ranks 161 out of 180 surveyed in terms of the freedom of the media, behind countries that have also been devastated by war including: Liberia 89 – Sierra Leone 79 – Afghanistan 122, South Soudan 125, Palestine 140, Burundi 145; DRC :150 and Iraq 156. President Kagame has changed the constitution to be able to rule Rwanda till 2034. He will have virtually ruled the country for 40 years that include 34 years as President and 6 years as Vice President and Minister of Defence when he was the real power behind the scenes. Many of his critics are either in jail, in exile or dead. Furthermore, according to a study carried out by the UCLA led by sociologist Andreas Wimmer, Rwanda has the third-highest level of political exclusion in the world (behind Sudan and Syria). The World Happiness Index report 2015, ranks Rwanda among the bottom five alongside, Benin, Syria, Burundi and Togo. Lastly, the institute’s Global Peace Index Report for 2015 on the trend of peace in the world ranks Rwanda 139th out of 162, which contradicts official accounts that it is among the most peaceful. In this regard, we would like to thank South African government for the compassionate and generous support that this country has offered to brothers and sisters who fled persecution from their countries. Rwandan refugees are grateful to the South African Government for resisting pressures from the Rwandan government and its powerful lobbyists to deny them of their refugee rights. Only peace, the rule of law and democracy, where there is freedom of expression to criticize harmful government practices and allows individual choices based on accurate information, can bring durable peace and sustainable economic development in Africa and the Great Lakes. South Africa has been a concrete example which has demonstrated that development without human rights breeds political violence and that repressive regimes adopt aggressive foreign policy as successive Apartheid regimes in South Africa. The apartheid South Africa had a very strong economy but its policies of social and political exclusion produced political violence. In the case of Rwanda as Prof Ghai who led a delegation of the Commonwealth Human Rights Initiative in 2009, rightly commented: “beneath the gentility of RPF leaders, the tidiness of Kigali, and its gleaming high rise buildings, I found a country deeply fragmented, operating under the hegemony of a small Tutsi political elite, which rules through oppression and fear”. On October 6, 2016, the European Parliament passed a resolution (2016/2910 (RSP)) condemning “the politically motivated trials, the prosecution of political opponents and the prejudging of the outcome of the trial”. It also condemned “acts of intimidation, arrests, detentions and prosecutions of opposition party leaders, members and activists, as well as journalists and other perceived critics of the Rwandan Government, solely for expressing their view”. The United States country report 2015 also stated “government harassment, arrest, and abuse of political opponents, human rights advocates, and individuals perceived to pose a threat to government control and social order; security forces’ disregard for the rule of law; and restrictions on civil liberties”. Due to restrictions on the registration and operation of opposition parties, citizens cannot change their government through free and fair elections. The report also highlighted “arbitrary or unlawful killings; torture and harsh conditions in prisons and detention centres; arbitrary arrest; prolonged pre-trial detention; government infringement on citizens’ privacy rights and on freedoms of speech, press, assembly, and association”. Just to give you a few examples, key political leaders including Mrs Ingabire Umuhoza, President of the FDU-Inkingi Political party, Deo Mushayidi of PDP-Imanzi political party are languishing in prison as well as senior military officials who include retired General Frank Rusagara, former military attaché to the UK, Lt Colonel Rugigana, Colonel Byabagamba (Tutsi) former head of the Presidential Guard were arrested and have been sentenced to long term sentences on politically related charges including allegations of criticising the government policies. Rwandan refugees who do not show their allegiance to the current government are perceived as enemies that need to be hunted down for allegedly representing a threat to the Rwandan regime. The closest incidents include among others, three assassination attempts against General Kayumba Nyamwasa, the assassination in South Africa of the former Rwandan of former chief intelligence Patrick Karegeya, former Minister of Internal affairs Seth Sendashonga and former Member of Parliament Colonel Lizinde Theoneste who were gunned down in Nairobi- Kenya. A former body guard who had served President Kagame for 20 years, Lt Joel Mutabazi, was kidnapped from a UNHCR safe house in Uganda in 2014 and brought back to Rwanda. He confessed to journalists that he had fled because he had grown “tired of the plots, political intrigue and killings orchestrated by the regime, and just wanted to live a normal life with his wife”. Major Nkubana was kidnapped from Uganda in October 2016. Following the murder of his former chief spy, Colonel Patrick Karegeya in a hotel in South Africa where he had sought refuge, President stated “Whoever betrays the country will pay the price. I assure you. Letting down a country, wishing harm on people, you end up suffering the negative consequences. Any person still alive who may be plotting against Rwanda, whoever they are, will pay the price…Whoever it is, it is a matter of time.” He added: “I hear some of our people saying: we are not the ones who did it. It’s true they were not the ones who did it, but that is not my concern, because you should be doing it… What is surprising is that you are not doing it”. It is a pattern that suggests the Rwandan government may have come to see the violent silencing of critics—irrespective of geographical location and host country—as a beleaguered country’s prerogative. The Rwandan army is accused of having killed at least 200,000 (two hundred thousand) Hutu refugees when it invaded the DRC in 1996 and 1998. According to UN Mapping report some of the crimes committed could qualify as genocide before a court of law. Paragraph 517 of the report point out that “The systematic and widespread attacks described in this report, which targeted very large numbers of Rwandan Hutu refugees and members of the Hutu civilian population, resulting in their death, reveal several damning elements that, if they were proven before a competent court, could be classified as crimes of genocide”. According to UNDP Human Development Index Report (2007) which was jointly published with the Rwandan government as a blueprint of “turning vision 2020 into reality”. “Rwanda’s high growth rates are deceptive in that they hide large and growing inequalities between social classes, geographic regions and gender”. On the list of 158 countries surveyed, the human development index in Rwanda is at the level of 1980s due to high horizontal inequalities in income distribution. A recent joint report by The United Nations Economic Commission for Africa (UNECA) and African Union (AU), entitled Dynamic industrial policy in Africa Rwanda among the few African countries where the richest 10% earn more than 40% of total income and the poorest 10% earn between 3 and 5%. UNDP report reveals that economic inequalities, have almost doubled in the last 20 years, placing Rwanda among the top 15% most unequal countries in the world. “The UNDP report also noted that if the inequality had remained at 1990 levels and 1985, with the current growth rate of 5.8%, the income of the 20% poorest Rwandans would have more than doubled”. The Rwandan regime has been destabilising the DRC as a strategy to hold on power as king maker in the region and to accumulate wealth from the mineral resources of the DRC. Presenting the final Report (Document S/2002/1146) of the Panel of Experts on the Illegal Exploitation of Natural Resources and other Forms of Wealth of the Democratic Republic of Congo, on Monday 28th October 2003 the UN panel chairperson Safiatou Ba-N’Daw said that the plunder of natural resources in the DRC had become the motive and engine of the war that has cost more than 3 million lives. The panel recommended the establishment of “an international mechanism” to prosecute high-ranking military and government officials, including relatives of Presidents Yoweri Museveni of Uganda and Paul Kagame of Rwanda. It also called for the United Nations to impose arms and trade embargo on Rwanda, Uganda and Burundi for plundering Congo’s mineral riches in their 2 1/2-year war to topple the former government of Kabila. 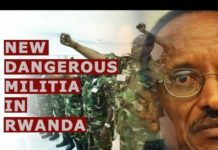 The Rwandan regime, to maintain control of regions of eastern Congo has created various proxy armies, including the militia called CNDP led by Laurent Nkunda, Congo’s most notorious warlord, CNDP whose record of violence in eastern Congo had destroyed entire villages, committing mass rapes, and causing hundreds of thousands of Congolese to flee their homes. Due to international outcry, he was arrested and put in a guest house in Rwanda. He replaced by Gen Bosco Ntaganda, now detained at The Hague. After his arrest the name was changed to M23 lead by Makenga. On the 21st June 2012, members of the United Nations Group of Experts on the Democratic Republic of Congo presented a report dated 18th May 2012 to the United Security Council and later released an addendum detailing the role of the government of Rwanda in the recruitment of Rwandan youth and demobilized ex-combatants as well as Congolese refugees for M23, provision of weapons and ammunition to M23, mobilization and lobbying of Congolese political and financial leaders for the benefit of M23, direct Rwandan Defense Forces (RDF) interventions into Congolese territory to reinforce M23, Support to several other armed groups as well as FARDC mutineers in the Eastern Congo. It was dislodged by the UN intervention force led by South African and Tanzanian forces. President Paul Kagame responded by dismantling the RCD and formed a splinter group known as National Congress for the Defence of the People (CNDP) under Gen Laurent Nkunda. Later, Nkunda was deposed and replaced with now ‘replaced’ by Col Sultan Makenga of CNDP metamorphosed into M23 proxy organization. In an attempt to control the politics of Burundi, President Kagame has tried to put in place a political leadership that pays allegiance to him, in order to do so he has tried to fuel ethnic strife by organising targeted killings of key Hutu political leaders to justify his intervention in Burundi, allegedly to stop genocide. Rwanda is engaged in destabilising Burundi. UN expert’s reports quoted in the testimony of Assistant Secretary Linda Thomas-Greenfield Bureau of African Affairs, U.S. Department of State, before the Senate Foreign Relations Committee, stated that “recruitment of Burundian refugees – including children – may have occurred in Rwanda in the past year, with training provided to facilitate their participation in armed groups seeking to overthrow through violent means the Government of Burundi”. The UN Special Rapporteur on the rights to freedom of peaceful assembly and of association, Maina Kiai gave a warning in his June 2014 address to the Human Rights Council, saying that “a society without room for critical voices to speak freely and peacefully is unsustainable” and highlighted that fact that “the fear of a new genocide cannot be invoked to Impede fundamental freedoms in any society, which in fact are necessary to prevent conflicts and genocide”. To use every leverage to bring Kagame to respect the right of his citizens and to release without any further delay all prisoners of conscience. Bring the Rwandan government to accept all-inclusive national dialogue to agree on legal and institutional mechanisms of governance that reassure every citizen. To urge President Kagame to stop sending death squads abroad to kill his critics and to end his destabilisation policy in the region. To follow up the UN mapping report (2010) with action by bringing to justice those responsible for crimes, crimes against and genocidal crimes as described in the report. To facilitate the hearing in a competent court of the crimes committed by President Paul Kagame, including alleged crime of genocide, and initiate an indictment. To institute protective measures for Rwandan, DRC and Burundian refugees living in South Africa against President Kagame hit squads.